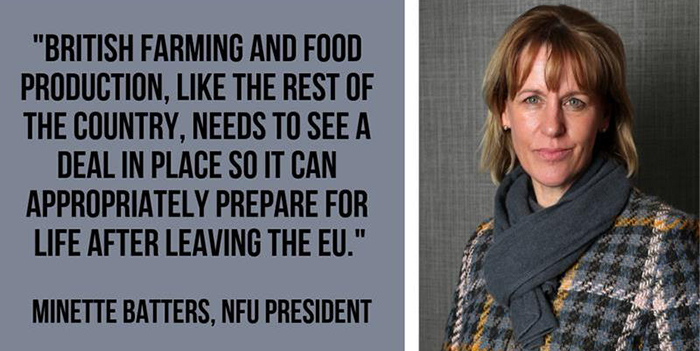 Responding to the votes on various amendments in the House of Commons on Tuesday night night, NFU president Minette Batters said: “The votes have done little to provide much-needed certainty for the future of food and farming in Britain, and time is running out. Mrs Batters added: “Leaving the EU without a deal could well mean a trade embargo is imposed on animals and animal products going to the EU which, along with punitive tariffs on all goods going into the EU, would severely restrict livestock farmers’ export markets. Mrs Batters said it is encouraging that the majority of MPs opposed a no-deal scenario in the votes, but no-deal cannot simply be wished away. She added: “An agreement negotiated between the EU and UK, and accepted by Parliament, must be reached urgently to protect the country’s ability to produce its own food and feed its people.